Instead of wasting time on "whispers" and "tips," in-the-know investors make money by doing less. Here are three dividend stocks these investors love. While traders spend time chasing rumors and tips trying to capture quick profits in the stock market, in-the-know investors understand that this method of investing rarely pays off. Often, it turns what should be a profitable venture -- owning stocks -- into a money-loser. Smart investors know that a far easier method of investing also happens to work much better: Pay a good value for high-quality companies, and then sit on your hands. By investing in a basket of great companies for the long term, you get to participate in the growth of those businesses, which should result in increasing the value of your investment far better than trying to guess your way to riches. It gets even better with dividend stocks, which can raise the payout regularly, further boosting your returns and making it easier to hold through the market's ups and downs. We asked three Motley Fool investors who know a thing or two about finding great dividend stocks to identify their top dividend stock ideas; they made compelling arguments for Brookfield Infrastructure Partners L.P. (NYSE:BIP), Waste Management, Inc. (NYSE:WM), and Xcel Energy Inc. (NASDAQ:XEL). In-the-know investors don't rely on rumors to make money. You shouldn't either. Image source: Getty Images. All three share a few powerful characteristics dividend investors should love: predictable, recurring revenues; minimal competition with high barriers to entry; and businesses that are in demand no matter what the economic environment. But that's just the tip of the iceberg. Keep reading about each company to learn whether it belongs in your portfolio. Jason Hall (Brookfield Infrastructure Partners): Finding solid companies is only part of the equation when it comes to identifying great long-term investments. 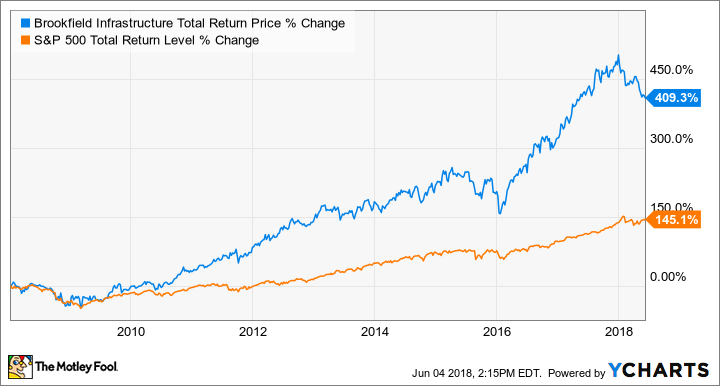 After all, even great companies can sometimes operate in mediocre industries with minimal prospects for long-term growth -- and that can lead to mediocre returns. Take a great company that operates in an industry with big growth ahead, and you can get far better returns. And this is exactly what makes Brookfield Infrastructure a top "buy now" dividend stock in my book. First, it meets all of the qualities outlined above, operating many utility-like businesses around the world, often with local or regional monopolies, that generate steady year-round, any-economy cash flows. Second, it operates in many countries, giving it solid geographical diversity. Lastly, infrastructure is a massive global growth industry, and will require trillions of dollars in expansion to support the growth of urban population around the world (as in billions more people) in coming decades. Brookfield Infrastructure is one of the best-positioned companies for investors to profit from this megatrend, as its management team has already demonstrated by delivering over 400% total returns since it went public, and doubling its stock's value over the past five years. BIP Total Return Price data by YCharts. As the stock is trading for less than 11.5 times trailing funds from operations and yields nearly 5% at recent prices, investors who buy now and hold for the long term should do incredibly well. 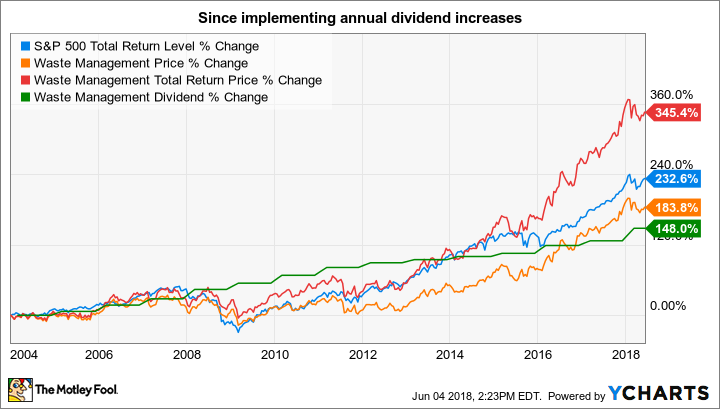 Chuck Saletta (Waste Management): Smart dividend investors know that a dividend is only as good as the earnings power of the company that pays it. That makes Waste Management's dividend particularly attractive. After all, as a garbage company, it deals with stuff that others produce but nobody wants anymore -- at least in its then-current form. Waste Management doesn't just deal with standard landfill trash; it also handles recycling services, and has the ability to turn landfill gas into energy for a greener way of generating power and fuel. That helps it diversify its revenue stream as companies adopt "zero waste to the landfill" policies, and other trash-reducing practices that would otherwise threaten its core business model. Its dividend right now sits at $0.465 per share per quarter, an amount it boosted by just over 9% earlier this year. That dividend represents a payout of less than 40% of the company's earnings, giving Waste Management room to continue increasing the dividend as its business grows over time. Speaking of that growth, Waste Management is expected to be able to boost earnings by a bit more than 12% annualized over the next five years, providing reason to believe the dividend hikes can continue. In addition to the covered and growing dividend, Waste Management trades at a reasonable valuation of around 19 times its expected 2018 earnings. That suggests that investors buying today are getting good value for their money, particularly if the company's earnings growth materializes as expected. That combination of dividend payment, growth, and a reasonable price makes Waste Management a dividend stock for in-the-know investors to consider owning. Maxx Chatsko (Xcel Energy): Although it seems to have been largely overlooked by investors, Xcel Energy is a must-know stock for anyone interested in renewable energy and dividends. Why? The company owns four regional utilities that are quickly moving toward a green future -- and powering a 3.3% dividend in the process. In 2005 just 3% of all electricity supplied by the company was sourced from wind or solar power. But that jumped to 23% in 2017 and could climb to 45% by 2027. The move toward clean energy will save tens of millions in operating expenses because wind and solar turbines don't require constant refueling, as do the soon-to-be-retired coal-fired power plants. That seemingly minor detail is a huge component powering Xcel Energy's expectations to grow both earnings per share and dividend payouts 5% to 7% per year for the foreseeable future. It promises to be a stable business and dividend for the long haul, too, as all revenue and profits are generated from regulated utilities. However, the growth plan and natural evolution of its power-generation portfolio both require the cooperation of state regulators. And right now, uncertainty regarding the cost of Xcel Energy's plan to retire coal power plants in Colorado and replace them with a combination of wind, solar, energy storage, and natural gas has weighed on the stock. While investors are still awaiting the decision from regulators to determine the ultimate cost of the proposed Colorado Energy Plan, the company's long history in the state and willing compliance with its aggressive renewable energy targets (some of the strictest in the nation) bode well for a palatable outcome for shareholders. Knowing that, the stock's recent slide seems like a great opportunity for long-term investors.